He has deep experience with gathering data in all kinds of situations – from mountains to classrooms - using varied methods and analyses from both qualitative and quantitative realms. This requires flexibility and responsiveness to the situations and people – and people are the center of each project. Statistical and methodological knowledge is, after all, without context and meaning if it lacks that direct human connection and application. Jeremy has also collaborated with other evaluators including Lifelong Learning Group at COSI, Blue Scarf Consulting, Palmquist and Associates, and the Institute for Learning Innovation. In addition to evaluation, he has helped design cultural programing, exhibits, and staff training in multiple contexts at The Children's Museum of Indianapolis and The Rhythm Discovery Center. He has also presented his research at international conferences (Visitor Studies, Society for Ethnomusicolgy, and International Symposium on Traditional Polyphony). Ethnomusicology is, by its nature, a multidisciplinary field - as Tim Rice put it, a "field of disciplines." Yet is also one beautifully entangled with people and "play," as Larry Witzleben has clearly outlined. We study study music in its cultural context and as a social process, we make and listen to music, we collect and analyze all kinds of data, we trace threads through anthropology, sociology, history, technology, economics, biology, religion (and other areas) all in order to understand the music itself, what it means to people, how those meanings are conveyed, and (potentially) why it "is." Put another way, ethnomusicologists study, talk to people, and make music to learn how and why things relate to one another to create meaning. In much the same way, STEAM as a holistic educational approach looks at how things connect to each other, sometimes in ways that are highly relative to the culture, subculture, and/or individual in that time and place. 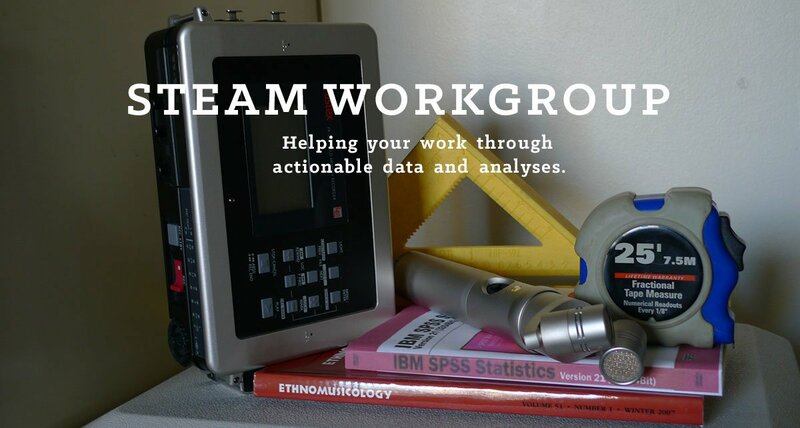 STEAM Workshop, working from a basis in education and ethnomusicology, incorporates this approach along with data driven analysis in helping find meaningful connections and learning experiences for your audience.